Who wouldn’t want the Grim Reaper to be his/her best friend forever? You get to pal around with the master of the forces of life and death. And in Billy and Mandy’s case, you get to boss him around. Talk about power. You also get to encounter all sorts of monsters and magic that most people don’t even know exist. I can see how that can lead to trouble pretty quickly. Just look at Billy and the whole Chocolate Sailor debacle. 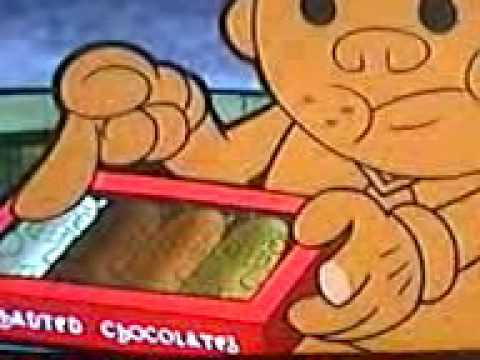 He becomes so addicted to the chocolate he’s supposed to be selling that he becomes solid chocolate and eats himself. It’s sad to say, but that would probably happen to me too because I like chocolate! I’ve just about taken out my dad over the stuff. Just like Billy. I’m not proud of it, but I just can’t stop. If the Chocolate Sailor offered me an assortment of enchanted chocolates, I’d have to try them all. So just in time for Halloween, here’s an assortment that you can eat all of without exploding into a big, chocolatey mess. Grease and line an 8 inch baking dish with parchment paper. Place hazelnuts on a baking sheet and toast for 15 minutes, or until deep brown. Let cool. Grind hazelnuts and sugar in a food processor for about 1 minute, or until smooth. Melt chocolate in a bowl over a saucepan of simmering water and let cool. Add vegetable oil, cocoa powder, vanilla extract, and salt to hazelnut paste and process until smooth. Add the melted chocolate and combine. Strain if there are excess hazelnut chunks. Let cool completely to thicken. Lightly grease an 8 X 8 baking dish with nonstick cooking spray. Dump powdered sugar into the dish and swirl it around until the bottom and sides are completely coated. Shake excess powdered sugar into a bowl for later use. Pour gelatin and 1/4 cup of cold water in the bowl of a stand mixer equipped with the whisk attachment. While the gelatin is blooming, combine the remaining 1/4 cup of water, corn syrup, sugar, and salt in a small saucepan. Place the saucepan over medium high heat and cook until the sugar has dissolved. Attach a candy thermometer to the pan and continue to cook, without stirring, until it reads 240 degrees F. Immediately take the syrup off the heat. With the mixer on low, pour the syrup into the gelatin. When all of the syrup is in the bowl, increase the mixer’s speed to high. Whip the mixture until it’s thick, about 12 minutes. Add the vanilla extract during the last minute of whipping. Turn out marshmallow onto a cutting board. With a lightly greased knife or pizza cutter, cut into marshmallows. I usually aim for 2-inch squares. Roll the marshmallows into the rest of the powdered sugar to coat all sides. Add peanut butter, butter, and powdered sugar in a stand mixer and beat on medium-low speed until combined. Melt half of the white chocolate in a double boiler or a bowl over a pot of simmering water. Stir in a small amount of light green food coloring. Spoon a small amount of chocolate into the chocolate molds of your choice and swirl around. Use a small paintbrush or similar tool to ensure that chocolate covers the entire mold. Dump excess chocolate back into the bowl. Let the chocolate set. Melt caramel and 2 tablespoons milk in a saucepan. Spread caramel and then buttercream in the mold, leaving enough room to encase it in chocolate. Pour more colored white chocolate on top to seal in caramel and buttercream. Tap mold on the counter to remove bubbles. Let chocolate completely set. Remove from mold. Melt milk chocolate in a double boiler or a bowl over a pot of simmering water. Spoon a small amount of chocolate into the chocolate molds of your choice and swirl around. Use a small paintbrush or similar tool to ensure that chocolate covers the entire mold. Dump excess chocolate back into the bowl. Let the chocolate set. Spread chocolate hazelnut spread in the mold, leaving enough room to encase it in chocolate. Pour more chocolate on top to seal in spread. Tap mold on the counter to remove bubbles. Let chocolate completely set. Remove from mold. Melt dark chocolate in a double boiler or a bowl over a pot of simmering water. Spoon a small amount of chocolate into the chocolate molds of your choice and swirl around. Use a small paintbrush or similar tool to ensure that chocolate covers the entire mold. Dump excess chocolate back into the bowl. Let the chocolate set. Melt marshmallows either in a small saucepan or in the microwave. Spread marshmallow in the mold, leaving enough room to encase it in chocolate. Pour more chocolate on top to seal in marshmallow. Tap mold on the counter to remove bubbles. Let chocolate completely set. Remove from mold. Melt the other half of the white chocolate in a double boiler or a bowl over a pot of simmering water. Spoon a small amount of white chocolate into the chocolate molds of your choice and swirl around. Use a small paintbrush or similar tool to ensure that chocolate covers the entire mold. Dump excess chocolate back into the bowl. Let the chocolate set. Spread peanut butter filling in the mold, leaving enough room to encase it in chocolate. Pour more white chocolate on top to seal in filling. Tap mold on the counter to remove bubbles. Let chocolate completely set. Remove from mold. Whenever I make candy, I try to make it worth my while. I just whip up a bunch of stuff and make candy until I run out of ingredients. You can easily make more or less of anything by halving or doubling any of the recipe. Antidote doesn’t have a specific flavor, so I made what I wanted. I wanted peanut butter, but you can fill it with whatever you want or not fill it at all. 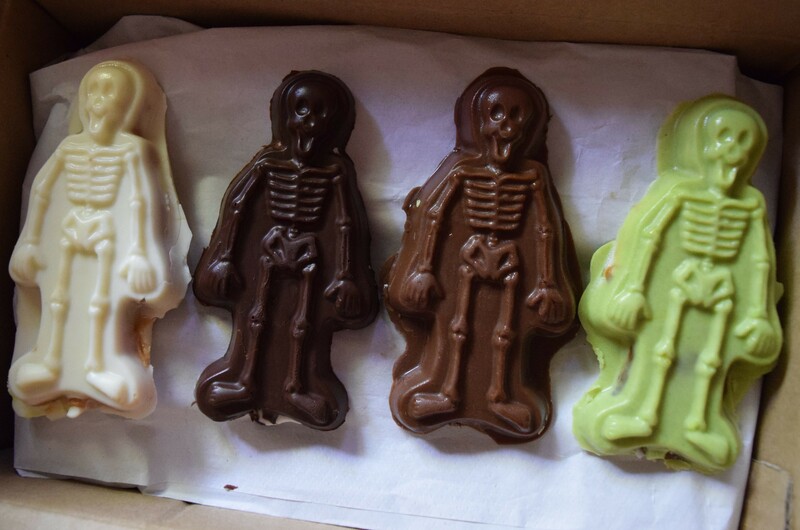 Although I have a ton of candy molds, nothing comes close to the big-mouthed monster looking things in the enchanted chocolate assortment. I used skeletons because they were on hand, but you can use whatever molds you want. If you don’t want to make them in molds, you can put the candy together in a parchment lined pan and cut them into bars. Now we’ve got an army of enchanted chocolates minus the enchantment part. As hard as I tried, I still ended up a big chocolatey mess. At least I’m still human. I think. So maybe I haven’t learned my lesson yet. Enough chocolate induced stomach aches and I’ll change my ways. Either that or someone gets me an issue of Man Eating Comics.